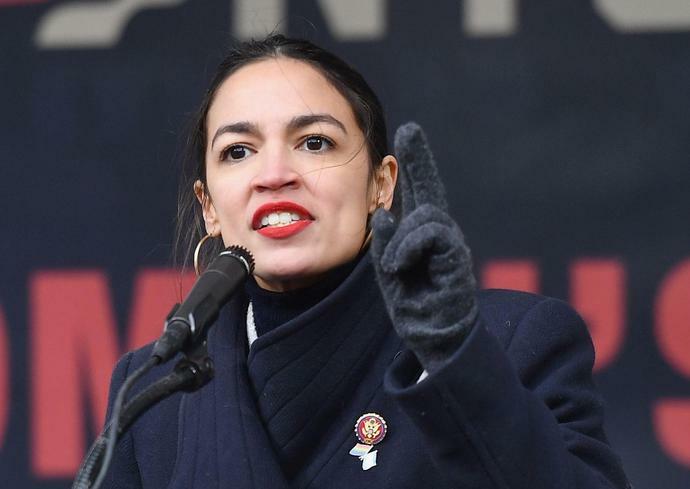 The youngest woman ever elected to Congress again made headlines and sparked conservative criticism when she said Monday that she and other young Americans fear "the world is going to end in 12 years if we don't address climate change." Rep. Alexandria Ocasio-Cortez, D-N.Y., made the remark during an interview with writer Ta-Nehisi Coates at the MLK Now event in New York City celebrating the legacy of Martin Luther King Jr.
Ocasio-Cortez called the fight to mitigate the effects of climate change her generation's "World War II." "Millennials, and Gen Z, and all these folks that come after us, are looking up and we're like, 'The world will end in 12 years if we don't address climate change, and your biggest issue is how are we gonna pay for it?'" she said. Climate change has been a driving issue for the freshman Democrat since arriving on Capitol Hill. Back in November, she joined a group of about 200 climate change protesters outside the office of then-Minority Leader Nancy Pelosi, D-Calif., when she arrived for her orientation. Since taking office, she has called for a "Green New Deal." In November, a 1,600-page report from the federal government said the climate is changing faster than at any point in modern history and that the impacts are already being felt. But a dozen years is a short timetable even those who are most concerned about the effects of global warming - such as naturalist Sir David Attenborough, who warned that climate change could lead to a "collapse of our civilizations and the extinction of much of the natural world." Many conservative commentators took issue with what they considered her alarmist statement about the issue. Ocasio-Cortez's comment on Monday was in response to a question about when and why she decides to "clap back" against her social media critics. She said her main priority is to call out what she believes are widely-accepted but incorrect assumptions, including the idea that people must choose between the economy and the environment. She said she does not take the criticism personally but sees it as a "deliberate strategy." "If you try to attack and discredit the messenger, then perhaps you can discredit the message," she told Coates. Due in part to rising temperatures from human-caused climate change, the gap between the world&apos;s poorest and richest people has increased in the past half-century. Earth Day 2019: High temperatures, rising waters, wild weather - who is to blame? We are.